This article considers the significance of contracts for public housing in New South Wales, how the provisions of tenancy law are used by FACS Housing to deal with crime and disorder, and the role of the Tribunal in tenancy legal proceedings. FACS Housing uses tenancy law variously as an attempted adjunct to supportive modes of “working with clients” and, on the other hand, as an instrument of authoritative control; though in both regards, tenancy law is a heavy, blunt instrument. The article suggests that safeguards in respect of FACS Housing’s use of tenancy proceedings are important, and that the problems of public housing neighbourhoods will be ill-addressed by legislating for further “crackdowns”. When the concepts of unjust enrichment and property are seen to cross paths, it is imperative that the boundaries of each concept are clearly delineated. In the Hong Kong case of Kingsway Finance v Wang Qingyi  1 HKLRD 260, Cheung CJHC affirmed the English position that subrogation to extinguished rights is based on unjust enrichment, not consent. This article examines the learned judge’s decision and considers its implications on the unjust enrichment analysis and the priority positions of subrogation based charge-holders vis-à-vis subsequent encumbrancers. Specifically, it is important that the elements of the unjust enrichment claim are rigorously applied in order to avoid doctrinal obfuscation. It is equally important that the proper role of unjust enrichment in the subrogation context is understood, as doing so would shed light on the relevant rules to apply when considering the position of a subrogated charge-holder who is to compete with a subsequent encumbrancer. In this note the authors examine two cases, one from Australia, the other from New Zealand, both of which explore the responsibility of legal practitioners engaged as professionals in the buying and selling of land. What is shown is that the allocation of risk and responsibility is constantly under scrutiny for those involved in the conveyancing process, something which the nascent Australian electronic conveyancing protocols will only heighten. New Zealand law recognises a range of covenants in relation to land. This article outlines covenants under the Property Law Act 2007 (NZ); specific statutory covenants such as consent notices and covenants under the Queen Elizabeth the Second National Trust Act 1977 (NZ); and covenants effected by means of an encumbrance. In highlighting the different species and origins of these different types of covenants, it also highlights their commonality, and makes suggestions for reform. The doctrine of notice was received into South African law in Cohen v Shires, Mchattie and King (1881-1884) 1 SAR TS 41 by reference to a 17th century Dutch decision and English equity. The reception of the polar star of equity has led to doctrinal problems and differing views as to requirements for the operation of the doctrine ever since. This is illustrated in the decision of the Supreme Court of Appeal in Meridian Bay Restaurant (Pty) Ltd v Mitchell 2011 (4) SA 1 (SCA). The Court mentioned fraud and equity as the doctrinal basis but also accepted the view that the doctrine is an anomaly which does not fit into the principles of either the law of delict or property law. The Court required actual notice (or dolus eventualis) and wrongfulness for the operation of the doctrine of notice. In the following discussion of the decision it is argued that for the operation of the doctrine it should be required that: (a) a prior personal right aimed at the acquisition of a real right existed; (b) a holder of a subsequent personal right was actually aware or foresaw the possibility of the existence of the prior personal right; and (c) the holder of the real right nonetheless infringed upon the prior personal right by concluding a subsequent contract and obtaining registration of the real right in the deeds office. The standard land contracts in Queensland require a seller of land to disclose to a buyer not only registered encumbrances, but also statutory encumbrances affecting the land. Whether a statute creates a statutory encumbrance over the title to the property is therefore a key question for a seller when completing a contract. This article examines relevant case law and provides some guidelines for when a statute creates a statutory encumbrance that should be disclosed to a buyer as a defect in title. In Korda v Australian Executor Trustees (SA) Limited the High Court provides some clarification as to the inference of an express trust on the basis of “commercial necessity”. The Court took a restrictive view, outlining and confirming the necessity that the terms of any agreement between the parties be unclear before an express trust is to be inferred on the basis of “commercial necessity” or “commercial undertakings”. This article highlights two recent decisions of the Supreme Court of Western Australia. 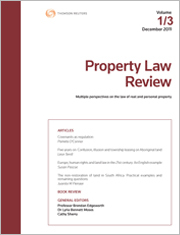 The first, Western Choice Pty Ltd v Lenz Corp Pty Ltd, addressed the Court’s power to order relief against forfeiture for non-payment of rent and also sounded a warning to landlords concerning their tactics and approach to litigation. The second decision, Claremont 24-7 Pty Ltd v Invox Pty Ltd (No 2), highlights the impact of the Electronic Transactions Act 2011 (WA) on more traditional provisions under the Statute of Frauds and the Property Law Act 1969 (WA) and provides a useful discussion of the priority rules. For the PDF version of the table of contents, click here: Prop L Rev Vol 5 No 2 Contents.